It’s well-known that practising yoga and meditation is good not just for physical health, but also for one’s sense of mental well-being. 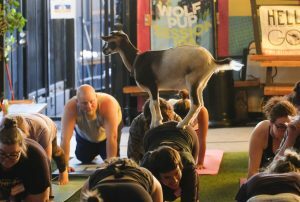 But what about the health benefits of practising yoga — with goats? Goat yoga was created to be a therapy for people and provide a happy distraction for those suffering from stress, illness or depression. It really works! Morse, who owns a farm and often found solace in spending time with her goats whenever she felt low, got the idea for goat yoga back in 2016 when she let a yoga instructor friend use her Oregon property for hosting a yoga class. Some cute and cuddly baby goats roamed in, nuzzling and climbing onto students, much to the delight of everyone. 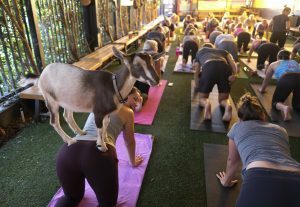 At that moment, goat yoga was born.